Punch Metro, however, learnt that prior to the incident, Anyanwu and Ugorji had sold their first child on credit to a man in Port Harcourt, Rivers State. The state Police Public Relations Officer, SP Andrew Enwerem, during a parade on Wednesday, said in the latest incident, the couple kidnapped and sold Nwachukwu for N500,000 to one Ifeanyinwa Duru. Duru was said to have resold the boy to one Mrs. Chidinma Emmanuel, for N700,000. The police spokesperson, who described the development as worrisome, said the couple, Duru and Emmanuel were nabbed in Aba, Abia State, adding that the child was rescued unhurt. Enwerem said, “On August 28, 2017, Ifeanyi Anyanwu, 23; and Amarachi Ugorji,18, conspired and kidnapped Ikechukwu Nwachukwu, who is two years and six months old, from his parents in Umuozu- Uguiri in the Isiala Mbano LGA. “The two suspects, after the kidnap, started demanding ransom from the parents of the child. When the parents of the kidnapped child could not provide the money, they opted to sell the child to one Ifeanyinwa Duru, 39, at the cost of N500,000. 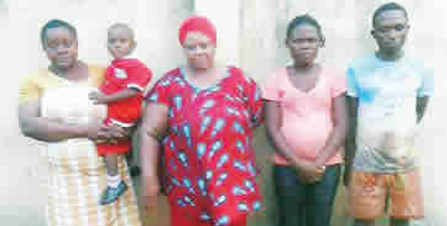 Duru, in turn, resold the child to one Chidimma Emmanuel, 42, at the cost of N700,000. “The two buyers were arrested in Aba following painstaking investigation, while the child was rescued unhurt and has since been reunited with the legitimate parents by the command. “The suspects have confessed to the crime and investigation has been concluded. The syndicate will soon be charged to court. Emmanuel said her desperation to have a male child after the death of her husband lured her into the crime. The couple told our correspondent that they had earlier sold their first child to an unnamed person in Port Harcourt for N200,000, on credit. A police source told Punch Metro that operatives of the command were already closing in on the buyer and would soon arrest him and rescue the child. Our correspondent learnt that 18-year-old Ugorji was already pregnant with another child.